The most celebrated actress of our time stars as the most powerful woman of her time. Oscar(R) winner Meryl Streep delivers the definitive portrayal of Margaret Thatcher, the enigmatic, highly controversial figure who became the first and only female Prime Minister of England. Much more than a biographical epic, The Iron Lady is also the surprisingly intimate journey of a "common" grocer's daughter whose social ambition and steel will --along with the love of her husband and confidant, Denis (Academy Award(R) winner Jim Broadbent) -- propelled her to unprecedented power in a world dominated by men. An Intimate Portrait Of One Of The 20th Century's Most Famous And Influential Women, The Iron Lady Heads To Retail On April 10, 2012! BEVERLY HILLS, CA - Anchor Bay Entertainment and The Weinstein Company announced today the Blu-ray(TM) Combo Pack and DVD release of The Iron Lady , starring two-time Academy Award(R) winner Meryl Streep (SOPHIE'S CHOICE, KRAMER VS. KRAMER) as former Prime Minister of the United Kingdom, Margaret Thatcher. Considered by many to be the greatest living film actress, Streep has received an astonishing 17 Oscar(R) nominations over the course of her career, including a 2012 Oscar(R) nomination for Best Actress in a Leading Role for her portrayal of Thatcher in The Iron Lady . Streep won a 2012 Golden Globe(R) award for this role, and received a 2012 Screen Actors Guild Award(R) nomination as well. Directed by Phyllida Lloyd (MAMMA MIA!) from a screenplay by Abi Morgan (SHAME), The Iron Lady heads to retail on April 10, 2012 for an SRP of $39.99 for the Blu-ray(TM) Combo Pack and $29.98 for the DVD. 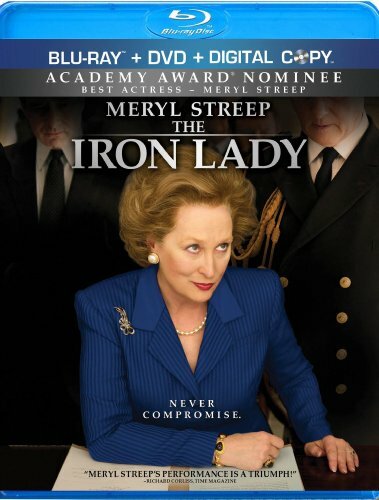 In his review for the New York Post, film critic Kyle Smith wrote, The Iron Lady is "Superb! One of the best movies of the year!" Added New York Magazine's David Edelstein, "Meryl Streep is too marvelous to resist!" Rolling Stone's Peter Travers also praised Streep, calling her "Incontestably great!," while TIME Magazine's Richard Corliss hailed Streep "The best actress of the year!" Added The New York Times' Charles McGrath, "Meryl Streep does that miraculous thing she does." The Iron Lady also stars Academy Award(R) winner Jim Broadbent (IRIS), Olivia Colman (TYRANNOSAUR), Alexandra Roach, Harry Lloyd ("GAME OF THRONES"), and Richard E. Grant (DRACULA). In addition to Streep's 2012 Academy Award(R) nomination for Best Actress in a Leading Role, the film also received an Academy Award(R) nomination for Best Makeup (Mark Coulier and J. Roy Helland). The most celebrated actress of our time stars as the most powerful woman of her time. Oscar(R) winning Meryl Streep, the most nominated performer in Academy Award(R) history, delivers the definitive portrayal of Margaret Thatcher, the enigmatic, highly controversial figure who became the first and only female Prime Minister of England. Much more than a biographical epic, The Iron Lady is also the surprisingly intimate journey of a "common" grocer's daughter whose social ambition and steel will --along with the love of her husband and confidant, Denis (Academy Award(R) winner Jim Broadbent) -- propelled her to unprecedented power in a world dominated by men. Combining fact, fiction and poetic flight of imagination into a new breed of biopic, director Phyllida Lloyd (MAMMA MIA) creates a piercing portrait which reveals the many faces of Margaret Thatcher: the hard-nosed conservative; the woman who demolished the barriers of gender and class in a male-dominated world; the spirited wife and mother who longed to change her country for the better. Exposing the private life behind the headlines, THE IRON LADY is a moving journey into the heart of an extraordinary, complex woman. The The Iron Lady Blu-ray(TM) Combo Pack and DVD special features include a "The Making of The Iron Lady" featurette and four mini-featurettes, including "Recreating the Young Margaret Thatcher," "Battle in the House of Commons," "Costume Design: Pearls and Power Suits," and "Denis: The Man Behind the Woman." Note: Special features are subject to change. The Weinstein Company (TWC) is a multimedia production and distribution company launched in October 2005 by Bob and Harvey Weinstein, the brothers who founded Miramax Films in 1979. TWC also encompasses Dimension Films, the genre label founded in 1993 by Bob Weinstein, which has released such popular franchises as SCREAM, SPY KIDS and SCARY MOVIE. Together TWC and Dimension Films have released a broad range of mainstream, genre and specialty films that have been commercial and critical successes, including Tom Hooper's THE KING'S SPEECH, winner of four 2011 Academy Awards(R), including Best Picture. Since 2005, TWC and Dimension Films have released such films as GRINDHOUSE; I'M NOT THERE; THE GREAT DEBATERS; VICKY CRISTINA BARCELONA; THE READER; THE ROAD; HALLOWEEN; THE PAT TILLMAN STORY; PIRANHA 3D; INGLOURIOUS BASTERDS; A SINGLE MAN; BLUE VALENTINE; THE COMPANY MEN; MIRAL; SCRE4M; SUBMARINE; DIRTY GIRL; APOLLO 18; OUR IDIOT BROTHER; I DON'T KNOW HOW SHE DOES IT; SARAH'S KEY; and SPY KIDS: ALL THE TIME IN THE WORLD IN 4D. Currently in release are MY WEEK WITH MARILYN; THE ARTIST; THE IRON LADY; and CORIOLANUS. Upcoming releases include W.E. ; UNDEFEATED; and BULLY. TWC is also active in television production, with credits including the Emmy(R) nominated and Peabody Award winning reality series Project Runway, the VH1 reality series Mob Wives, and the critically acclaimed HBO comedy/crime series The No. 1 Ladies Detective Agency which also received a Peabody Award. The company is currently producing After The Runway, Project Runway All Stars and Project Accessory. The company currently has 17 series in different stages of development, including Marco Polo, a scripted historical series about the great explorer; and The Nanny Diaries, being adapted for ABC by Amy Sherman Palladino (Gilmore Girls).